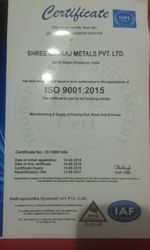 Shree Giriraj Metals Private Limited is experiencing growth at a very brisk pace since its establishment in the year 1981. Engrossed in Manufacturing a wide consignment of products, we offer Welding Electrodes, Silver Brazing Rod, MS Welding Rod, Welding Helmet, etc. These products are made under the command of trained personnel using finest class basic components along with modernized tools and amenities. To add, these are examined thoroughly before getting delivered at the end of our customers. Also, the complete range is accessible with us in a consignment of standards and altered provisions at market leading costs. Further, these are well packed to retain their safety while transportation. We believe in fulfilling all the rising needs of our patrons with perfection within the assured span of time. As well, all the working right from the procuring of basic material till the final testing, production, and delivery are divided into many departments for a well-efficient finishing of tasks. As well, to control their processes in a trouble-free way, we have hired with us experienced and skilled personnel that is working with supremacy to accomplish the repute our company has developed over the years. All these features have assisted us in conquering an extensive patron's base all over the nation. Under the proficient leadership of the honorable mentor Mr. Sharad Agrawal, we have earned a notable standing in the industry. The profound knowledge and rich experience he holds in this industry have assisted our firm to acquire distinguished standing in this industry. Rendering quality products and prompt services, the company has ascertained huge clientele in different regions of the globe. The clientele is increasing day-by-day that reflects the genuineness of the products and our credibility. Moreover, we strive to maintain a long-term relationship with our esteemed clients. Our state-of-the-art infrastructure unit is backed with technologically advanced tools and machines that assist in the quality and quantity production of the Brazing Products. The robust infrastructural base has played a vital role in strengthening the market position of the company. The manufacturing unit is located in Vrindavan, Mathura (U.P. ), India and the procedures are managed under the efficient headship of the experts. Owing to the priority to serve quality products, various stringent quality tests are conducted under the supervision of our quality control executives. For fuller assurance of the quality, the products are tested at various levels of production to the final packaging. The quality checks have also made us competent in delivering products conforming to national as well as international standards such is Indian Standard (IS), AWS and Din. In adherence with the varying desires of our honored clienteles, we are devotedly engrossed in bringing forth an exceptional class assortment of products to our patrons. In conformism with the advanced market guidelines and norms, all our products are developed as per the norms provided by our clienteles. As well, our intelligent business strategies, on-time shipment, patron friendly approach, simple payment modes, huge distribution network allows us to acquire enormous satisfaction of our clients spread all over the nation which has made us a preferential options in the industry. We offers a wide range of Silver Brazing Alloy Rods, Wires, Foils, Copper Brazing Rods, Brass Brazing Rod, Nickel Bronze Brazing Rods, Tin Solder with Silver, Deoxidised Copper Wire, Phos-Bronze Brazing Rod in Brand name "Tech Braze®" & Silver Flux, Copper Flux, Brass Flux, Aluminium Flux in Brand name "Tech Flux™".